Pestilence, Plague, or Poison? Princess Alba must save the dragons before it’s too late! When disease strikes the dragons of Mount Fornax, Alba and Fyrian suspect the sinister new troll instructor of performing dark alchemy. But a twist of magic sends suspicion falling onto Alba, making her the target of unwelcome scrutiny. 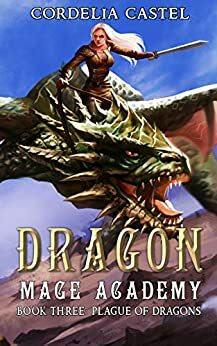 With time running out before the dragons succumb to the disease and Fyrian too weak to help, Alba must join forces with an old enemy to uncover the truth behind the plague before it turns deadly. Join Alba on this page-turning adventure to rescue the dragons! 5.0 out of 5 starsA diamond of the first water! Following the events of the second installment of “Dragon Mage Academy”, “Plague of Dragons” picks up right where the previous installment left us. Alba finds herself expelled from the Academy, and has to attend the Council of Dragons, where her fate in the Academy will be decided. After being reinstated, and while she has all the good will to be a model student, a new threat emerges. The dragons fall ill and, because of her bond with Fyrian, Alba shows the same symptoms, making her a suspect in the eyes of some. The illness is fatal, but no one can determine the cause or a cure. With time running out and the dragons in mortal danger, Alba sets on a new adventure with the help of her friends and teachers. But nothing is what it seems. Can she trust a notorious troll or King Magnar to help her in her race against time? Cordelia Castel’s unique pen has once again captivated me. She has created a unique fantasy world, where magic intertwines with fast-paced adventure, mystery and suspense. With each book this fantasy world expands to include more areas, more fantastical creatures, more magical beings, while subtly addressing personal issues and interpersonal relations that we can relate to in our modern-day life. An excellent book and an excellent series, that I highly recommend to all fantasy fans, no matter their age!!! I‘m reading all of the author’s books in this series and it’s hard to stop and take a break. It’s extremely hard to find such an interesting and exciting author who not only writes intelligently but also provides top rated plots, characters and excitement in the stories. With disease affecting the dragons Alba has to help find out what’s going on and find out who. She has an idea but they twist things and make her look guilty. Now she has to get the help of an old enemy to help find a cure to save the dragons before it’s to late. 5.0 out of 5 starsGreat 3rd book! !